There's a feast of earnings out Tuesday. We'll get to see how breakfast cereals are performing compared with cars and cable. Here are the four things you need to know before the opening bell rings in New York. 1. Earnings: Kellogg (K), Office Depot (ODP), Sprint (S) and TransCanada (TRP) are among companies reporting ahead of the market open. Another batch after the closing bell will include Tesla (TSLA), CBS (CBS), Groupon (GRPN), Cablevision (CVC), Denny's (DENN), Herbalife (HLF) and Etsy (ETSY). 2. Market movers -- Activision, King Digital, Standard Chartered, UBS: Shares in the global bank Standard Chartered are dropping by about 7% in London after announcing Tuesday that it is cutting 15,000 jobs after posting a surprise loss in the third quarter. The bank is asking investors for another $5.1 billion that it plans to spend on technology infrastructure and other strategic opportunities. Shares in Activision (ATVI) are rising almost 3% in premarket after it announced it is buying Candy Crush maker King Digital (KING) for $5.9 billion. Activision is best known for producing traditional video games like Guitar Hero and Call of Duty. Shares in King surged Monday as investors anticipated a takeover. UBS (UBS) shares are down about 4% in Europe after the Swiss bank posted its latest earnings. Third quarter numbers beat expectations but the Swiss bank said it expected a key measure of profitability to be weaker next year than previously forecast. 3. Focus on cars: Volkswagen (VLKAY) shares are falling almost 3% after regulators suggested the emissions scandal extends to the Porsche Cayenne model. Porsche is part of the Volkswagen Group, which also includes Audi. VW disputed the regulators' claim. Later today car companies will be publishing their October vehicle sales numbers in the U.S.
4. Stock market overview: Investors can't seem to decide whether they want to buy or sell. U.S. stock futures are dipping in the red, though the move down is minor. European markets are quiet in early trading, while most Asian markets ended with gains. On Monday the Dow Jones industrial average turned positive for the year after rallying 165 points, closing 0.9% higher. 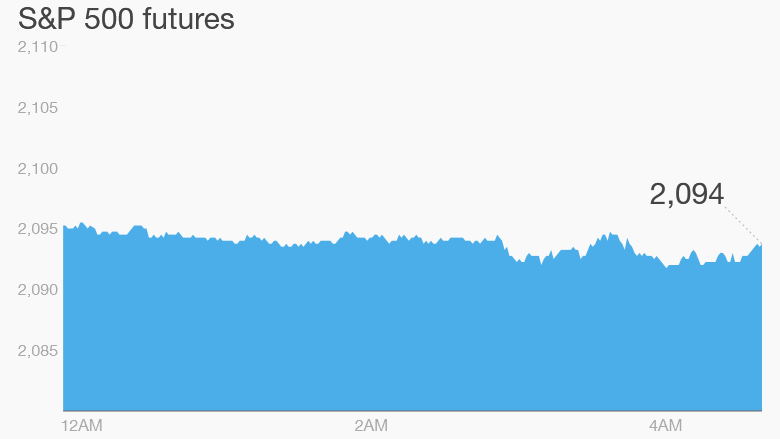 The S&P 500 added 1.2% and the Nasdaq gained 1.5%.